Much attention has been given over the past 20 years to a phenomenon which, rightly or wrongly, has been linked to Artscroll, namely the question of sanitized, legendary or inaccurate biographies which are supportive of ideology (or inspirational). It will probably come as not too much of a surprise that Shadal, whose 146th yahrzeit was this past Yom Kippur, already had much to say on the subject, and it was the very opposite of the supposed Artscroll approach. Some background: Shadal wrote a lot of autobiographical material. This was motivated by his belief that ideally every human being - great or small, good or evil - should write an autobiography, provided that it is truthful. As one who derived great pleasure from the smatterings of biographical material scattered over all of Jewish literature, he lamented the fact that we will never know the inner life of great (and regular) people, and we will never know how they developed. The only cure for this is not to make the same mistake, and so we should truthfully record our own history and our own development. Thus he did not neglect his own duty, and wrote a great deal of his own autobiography, in several versions, with a special emphasis on his first 20 years. Predictably many readers were puzzled by certain trivial things he mentioned, e.g., he writes about how he remembers one night that the family's cat gave birth to a litter on his bed, so rather than disturb it he sat up all night translating a poem by Mestasio, which can be found on pg. 84 of his Kinnor Na'im. But for Shadal this was the point. Obviously it would be impossible to truly write of everything one ever did, every thought one ever had. But the point of autobiography could not be to write with the reader in mind. That would compromise truthfulness and, frankly, lead a person to self-censor so as not to be embarrassed. "La mia fiducia fu anche per qualche temp alimentata da un accidente da nulla accadutomi nel 3 Ottobre (la notte di Kippur), del 1816, e da me, dietro il Talmud (in fine di Joma) superstiziosamente interpretato qual pegno della celeste protezione. Anche questo avvenimento fu da me nell'Ottobre del 1817 celebrato in un- Ode di ringraziamento a Dio." "My confidence was fueled by an accident which happened to me on October 3, 1816 (the night of Yom Kippur), which I superstitiously interpreted as a pledge of heavenly protection, following the Talmud in Yoma. This event was celebrated by me in October of 1817 in an ode of thanks to God." At which point most people are probably thinking, Huh? Which is probably not what you were expecting. What he says is that on the night of Yom Kippur 5577 (1816) he experienced a nocturnal emission. Since it is written in the Shulchan Aruch (OH 615b) that a person who has such an emission on Yom Kippur should worry the whole year that he will die, but if the year passes it is a good sign that he is destined for Olam Habah (which follows Yoma 86a), then that is just what 15-year old Shadal did. He marked off the year, until it had passed, and then he wrote a song of thanks to God. These "memories," incidentally, are actually based on entries from his diary from that era. Contrast this with Moshe Leib Lilienblum's description of the same event in his youth, which caused him absolute terror. Lilienblum's own autobiography, which he says was in part inspired by Luzzatto's (although he says that Shadal's is as dry as corn) ,was called חטאת נעורים, the 'Sins of Youth.' Lilienblum quotes Shadal as saying that he much prefers autobiographies to novels, and non-fiction to fiction, while Lilienblum says that he gained nothing from biographies, but gained much from novels. However, Lilienblum agrees that a good biography caould be much more inspirational than the best novel. His book is a record of his life beginning as a standard, traditional Jewish boy, a proficient Talmud student, and an early marriage, to his time as a young rosh yeshiva, and then his transformation to a persecuted heretic. A theme in the book is that he did not want to become a heretic. Whenever he had doubts, he looked for some Talmudic source to lean on. If he couldn't find one, he would force himself to believe, even though as of the writing he recognizes that you can't force yourself to be a believer. 1. you shouldn't sleep on the night of Rosh Hashana or Yom Kippur. Rosh Hashanah, in case you will have a nightmare, which is an ominous omen for the coming year. 2. Yom Kippur, in case you will have a nocturnal emission, as mentioned. After Kol Nidre he said Viduy and the four chapters of Tehillim considered a segulah against a nocturnal emission, and then he went to sleep. He awoke, and his heart sank because of what he saw. He'd have to worry all year . . . "Don't laugh at me," he warns the reader. He continues that he was terrified and haunted. For the next 30 days he recited a certain litany of prayers meant to counteract the evil effects of what he experienced. Evidently this mentally exhausted him. He says he throw himself back into Shas and Poskim. [negative responses aren't] directed toward me; they are toward my Autobiography, because they are of the view that I expound on minor and irrelevent things. I know that many readers feel this way. However, I will not change from my way, and if the reader won't be receptive, I won't respond. But to tell my autobiography without referring to small matters, and minor things that are in my memory, what I did and what I thought in my childhood - God forbid that I would not - for my purpose is to reveal the truth, and now that I am engaged in that enterprise, should I not fulfil it? All my days I have been disturbed by the sparse records of our earlier and more recent ones, which we only know through spotty references and legends. So should I not do what depends completely on me? How much good has been lost through fear of the scoffers! In my old age I shall not neglect this important duty. Is there anything more unappealing than a nocturnal emission? But see the recent edition of Kochebe Yizchak, where I published my hymn of thanksgiving that I wrote 46 years ago. I was not ashamed to see it in print. I was glad to see what my contemporaries have to say about it. Maybe now, people will be forthcoming. I'm also glad that now that I have written about it, there is a context for that hymn which I published, which otherwise would be lost on readers. (Igg. Shadal Vol. II pg. 1388 - 89). Now that is laying down the law. I'm surprised that a scholar of your caliber, engaged in careful researches into antiquities, how could you rob the historians of 800 years from now of such gems as these [that I wrote in the letter]? Wouldn't you yourself rejoice if you found a letter like it from the ancients? - even an insignificant one like myself (if it were possible for a rishon to be minor, like an acharon) although us Jews know that "there is no generation which doesn't have one like an Abraham, a Jacob, a Moses, or a Samuel" (Midrash Samuel 9). There are many other interesting things in his autobiograph(ies) and here are a couple: Although he makes it clear that he was quite the child prodigy, he nevertheless offers plenty of material showing his childish mistakes and immature ideas. (In fact, his childhood seems to have been a curious blend of, well, childhood, and deep immersion in books and ideas that one generally would think are too big for a child's britches.) For example, he writes that when he was 8 years old he was convinced that he would write commentaries on the Bible that were as good as Rashi's. Apparently he boasted of his own innovative Bible comments to his classmates, who asked for samples. So he proudly told them that he had solved the mystery of which land is "the land of Uz" (Job 1:1). It was Bet El! For we find in Gen. 35:6 as well as Joshua and Judges, that Uz is the former name of Bet El: "So Jacob came to Uz, which is in the land of Canaan--the same is Beth-el--he and all the people that were with him." To his chagrin, he later realized that the verse actually reads "So Jacob came to Lutz," not "Uz!" As I said, there were two-three versions of the autobiography. The Italian one (which was translated to English, German and Hebrew) contains his family's history. Here is an interesting sample from that. Shadal, whose great-grandfather was R. Moshe Chaim Luzzatto's brother, was quite poor. His father was employed as a wood-turner, and the son attests that his father was quite skilled -indeed his chair and writing desk were built by his father - but he never made an adequate living. Although the son does not say that this is the reason, he describes his father as spending every spare minute learning, and one sometimes gets the sense that he didn't vigorously pursue work at all so that he could learn. On the other hand, Shadal dramatically describes how his father did plan for him to have a career, first ensuring that he learned Latin so that he could become a physician, then apprenticing him in wood-turning. When it became clear that the boy had no intentions of doing any of these things, no intentions of doing anything besides learning, writing and teaching (although no one knew that yet) his father wrote him a dramatic document basically saying that he fulfilled his duty as a father to teach his son a trade and now it's on his son's head. In any case, the Luzzattos were a famous Italian Jewish family - and a wealthy one. Or had been. Why was his branch poor? Shadal writes that there had been money in the family, but his grandfather was disinherited over the following incident, which occurred in Venice in 1737: his grandfather Benetto (Baruch; b. 1713) was as yet unmarried, and he spotted a woman reciting Psalms, very exactly and impressively. He was smitten. He said, If I found a woman who could read Psalms like that, I would marry her! The woman politely declined - because she was already married, but said that her sister wasn't married, and she could zug tehillim with the best of them (better than herself, is how Shadal tells it). And that's the woman he married. Rachel, the daughter of the deceased Rabbi Anselmo Isaac Grego, came with a dowry of 1100 ducats, but it never materialized. Because of this his mother did not approve of this match and threatened to disinherit him if he married her. He did anyway, and she did, and the rest was history. Shadal says that the portion he lost was 2000 ducats, and this plunged him into poverty. He says that his grandfather worked as a teacher and a dealer of cloth, iron and wood, and his grandmother spun silk, and that is how they honorably eked out a living. Regarding his autobiography, the first published version appeared in Isidor Busch's German periodical in the late 1840s, and it covered his family history and his youth up to age 18 (which he considered a distinct period in his life). Busch had asked him for a contribution, suggesting an autobiography. Shadal's introduction explains and justifies why it is that he, who is of little account, should comply. He quotes Massekhet Shabbat 118a "יודע אני בעצמי שאיני כהן אם אומרים לי חבירי עלה לדוכן אני עולה," "I know that I am not a kohen; but if they say to me 'Ascend to the platform,' I will ascend." It was written in Italian, and Busch or someone else translated it to German. Part of this appeared in English translation in the pages of the Jewish Chronicle, and then again in the M.H. Bresslau's Hebrew Magazine in 1859. 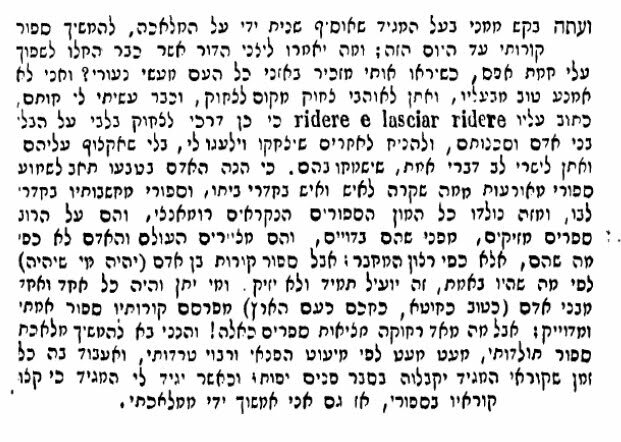 A Hebrew version, actually written earlier than the Italian one, appeared in a Hebrew book of letters, מכתבי שפת קודש in 1857. 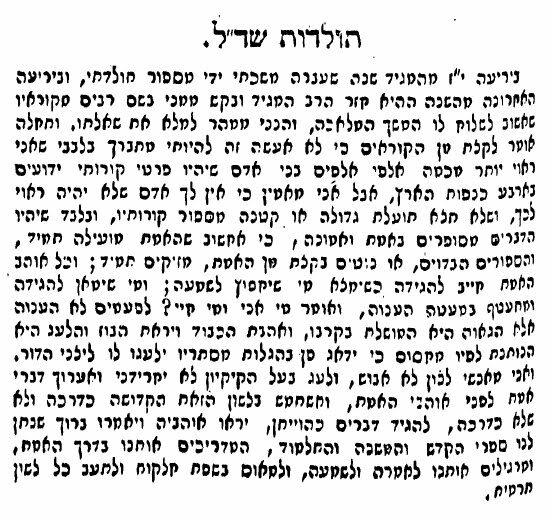 Finally, a much fuller Hebrew autobiography was serialized in Hamaggid from 1858 to 1860 and then 1862 to 1863. The complete Italian autobiography was serialized in the periodical Mose in 1880, and was eventually published as a single volume called Autobiografia. This version was also translated to German, to English (by Sabato Morais) and finally, to Hebrew, by M.A. Shulvass and published in Yeshiva University's Talpiot, and then printed as a separate volume called Pirke Chaim. All these versions agree on particulars, but they all include information or details that the others omitted, so all should be read. As you point out, it is impossible for anyone to keep a record of every single thought and action. Would it not then follow that regardless of how intellectually honest a person tries to be, one will inevitably self select the thoughts/actions that portray himself in the light that he would like to be viewed? Even the inclusion of incidents that some might consider negative can be (perhaps cynically?) explained as the author actively trying to convince the reader of his own honesty. "Rabbi David Kimchi, a noted Jewish Commentator, who lived about five hundred years ago, explains that passage in the first Psalm, His leaf also shall not wither, from Rabbins yet older than himself, thus: That even the idle talk, so he expresses it, of a good man ought to be regarded; the most superfluous things he saith are always of some value. And other ancient authours have the same phrase, nearly in the same sense." LkwdGuy, indeed. Much more to say, but the day is short. Suffice it to say that while I do believe Shadal was very honest, he was more complex - he very much enjoyed stirring the pot, and seemed to take satisfaction from staking out positions which bothered people, both conservative positions, and liberal ones. In this case I don't think it was a ruse at all, but I do think that he was attempting to convince readers - in this case mostly liberal ones - of his essential quality of truth-seeking - but I also think that any game playing was probably very subconscious. I like the seal that Shadal says he made for himself, "Ridere e lasciar ridere" -- "Laugh and let laugh." What if the ArtScroll hagiographers' committee was so impressed with Shadal's candor that they voted to replace the standard "...knew all of Shas by heart at age 3" with "One Yom Kippur night, when he was 15..."? "while I do believe Shadal was very honest, he was more complex - he very much enjoyed stirring the pot, and seemed to take satisfaction from staking out positions which bothered people"
Think Gershon Scholem says the same thing about R. Yonason Eibuschutz. The post above was me. Moshe Leib Lilienblum's struggle with belief seems to indicate what today would be called Obsessive Compulsive Disorder. It is interesting that this struggle is noted in the context of a post on Shadal, as Shadal was of the opinion that the Torah does not mandate belief as belief cannot be mandated. In fact, he felt that the idea that belief was mandated caused much ill. Thanks for linking to חטאת נעורים. I find these autobiographies extremely fascinating as they provide a real window to life in previous eras, besides for just having interesting stories. His uncle didn't say "you shouldn't", he said "he couldn't". ״אינו יכול לישון״. Has anyone actually studied all the Art Scroll biographies in order to determine whether the streotypes are true? Re a seminal emission on Yom Kippur night: There are many letters from the Steipler in Kiryana de-Iggarta to Yeshiva students saying that the gemara applies only to older married men where this would be an unexpected and unsual occurence. "Has anyone actually studied all the Art Scroll biographies in order to determine whether the streotypes are true?" I doubt it. I've read a few, and in my preliminary opinion they aren't quite true. They sort of are, but not exactly. No, they are not all interchangeable. And almost everyone has a few stereotype-busting nuggets. But what they all have in common is that the protagonist never did anything that was unwise, that can really be argued on with any justice, or wasn't borne out by time to be correct. They also are all portrayed as having great depth and breadth of Torah knowledge; you know, the town where the children are all above average. If you read between the lines then you'll notice that while they go on about dikduk for R Yaakov Kamenetsky, they don't mention that about R Moshe Feinstein and so forth. So when you compare them you do see differences. But its possible that this is apparent to people who are really into history and biography, people who are filling in some of the cracks with their own prior knowledge. It could be that to the general public they all seem virtually identical.